Compare funeral directors in Bexleyheath and read verified reviews on the UK’s online funeral resource. Use Funeral Zone Listings to find local funeral directors in Bexleyheath that meet your specific needs. You can organise the search results by ‘best rated’, 'nearest' or ‘most reviewed’. There is also a handy Google Maps feature so you can see exactly where each funeral home is in relation to each other. The funeral directors' services on the day were first class. The rating has been downgraded because staff in the office were dealing with a potential customer who had called, leading to my family having to sit for 20 minutes in the waiting area before we were able to be seen for a scheduled appointment. Whilst we were waiting,a mobile phone with a popular tune rang a number of times without being answered. Surely it should not have been on in a funeral directors? In addition, when we took clothes into the office,we waited downstairs without any attention when it was clear there were people upstairs who knew we were there. Superbly professional and friendly throughout. At a difficult time, they made thimgs easy to negotiate. Bexley Funeral Service provide a complete package. They were kind, caring and considerate at our time of need during a tragic loss. The family were kept updated throughout and on the day of the funeral the staff were respectful, well presented and made the sad experience go smoothly. 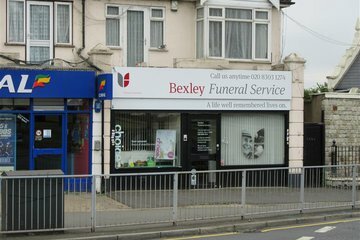 I would thoroughly recommend Bexley Funeral Service.